A native of Detroit, Michigan, Ann Weaver began her musical studies at age six with her parents, both of whom were members of the Detroit Symphony Orchestra at the time. 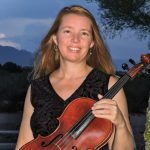 She began her college studies at Arizona State University, then completed her Bachelor of Music degree at the Cleveland Institute of Music, where she was given the Annual Viola Award for Outstanding Achievement. She earned her Master’s degree in Music Performance at Rice University, where she graduated with honors. Her teachers include Dr. William Magers, James Van Valkenburg, Heidi Castleman, Wayne Brooks (principal violist of the Houston Symphony), and Roberto Diaz (principal violist of the Philadelphia Orchestra.) Her chamber music coaches have included Anne Epperson and members of the Julliard, Guarneri, and Cleveland String Quartets.